This course will be REBROADCAST on: Wednesday, March 22, 2019, 11:00 AM – 12:00 PM EDT. Attend the upcoming rebroadcast to receive CE without the need to take the online exam. Purchase of this course prior to the rebroadcast date gives you access to the online recorded webinar course immediately (quiz required to receive CE credit), and allows you to register for the Rebroadcast session on Wednesday, March 22, 2019, 11:00 AM – 12:00 PM EDT. 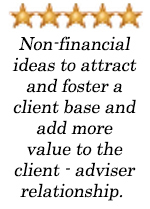 Now more than ever, advisors must realize that there is much more to retirement than just the dollars and cents. Fact is, people are failing at retirement at an alarming rate because they aren’t prepared for the non-financial aspects of it. During the webcast we will expose the fatal flaws of traditional planning, discuss how industrial age thinking about longevity is confusing clients, provide an exclusive look at how retirement coaching will push benefits planning into unchartered territory, and simple steps to make an immediate impact! This is a game changing opportunity to become part of an exclusive group of professionals who see the significance of this trend and want to capitalize on it. Don’t be the last one to figure this out. Be more referable because of the impact you are having on others. Your presenter is Robert Laura, CPRC, Retirement Activist. 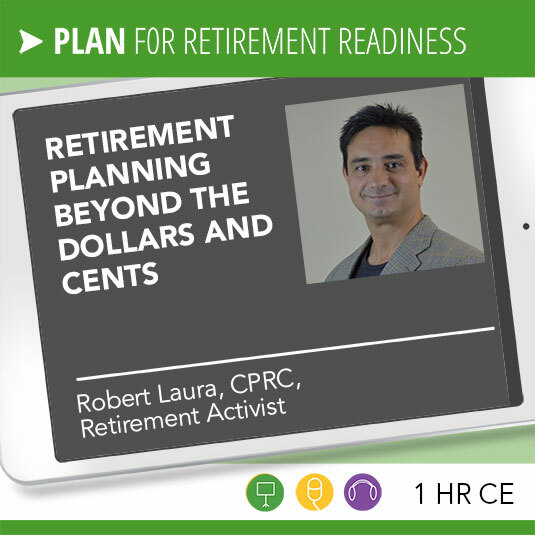 Robert Laura, CPRC is the Retirement Activist who is committed to changing the way people think about and prepare for every aspect of retirement. His nationally syndicated columns at Forbes.com and Financial Advisor magazine reflect his groundbreaking efforts to challenge the status quo of traditional retirement planning. As a former social worker and certified personal trainer turned money manager and author, he has found that retirement is among the most fascinating, yet least understood, phases of life. Through interviews with celebrities, professional athletes, entertainers, leading experts, and his own clients, he's developed a powerful message to tackle the mental, social, spiritual, and financial aspects of retirement. His objective is simple: to help people create a no-regrets retirement plan. As the RETIREMENT ACTIVIST, Robert runs the Certified Professional Retirement Coach Designation, founded RetirementProject.org and Retirement Coaches Association. He has authored Naked Retirement, Retirement Rx, and a number of guides to help individuals succeed in this next chapter of life. In addition to his own writings, he frequently appears in major business media such as Wall Street Journal, CNBC, and Investor's Business Daily, Yahoo Finance, The Street, and more. Robert conducts training for other financial professionals, as well as workshops and webinars for individuals and couples, designed to help people prepare for every aspect of retirement. He has been speaking and teaching economic, investment, and retirement programs for nearly 20 years..
We will report your CFP® and/or CRC® credit (no additional reporting fee) – please add your ID at checkout. You are responsible for reporting all other certifications for CE credit. The $29 fee is waived for all 90 Days – $99 and 365 Days – $199 subscriptions. Subscribers have ALL ACCESS to this and 60+ other live, rebroadcast, and on-demand courses at no extra fee! Your satisfaction guaranteed: We know that you will be pleased with your purchase of this product. If, however, you are not completely satisfied notify us within 30 days of your purchase to receive a full refund of your fee, less any CFP® CE reporting fee for the course that was filed prior to cancellation.